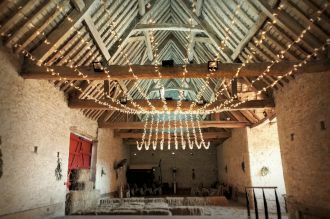 The strands of fairy lights run from the beam at one end of the barn, via the middle beam, to the beam at the far end of the barn and are spaced wide-narrow-wide to create an elegant bow shape overhead. The structure of the Wheat Barn and the smaller Barley Barn lend themselves well to several fairy light designs (e.g. crossed strands and widthways - see here for more details) along with other styles of lighting including festoons, paper lanterns, chandeliers and uplighting. 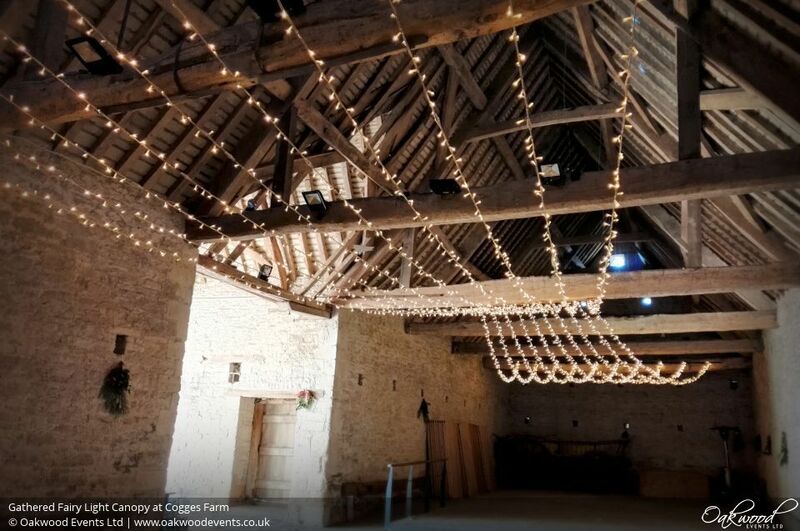 There are lots more ideas and photos for lighting displays at Cogges Manor Farm on our main Cogges lighting page, or by all means get in touch and we'd be happy to discuss ideas! 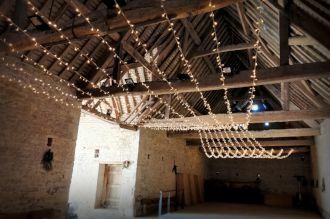 We just wanted to send you an email to thank you for the fairy lights you did for our wedding... they were incredible!!! We are so pleased we chose you to do them for us and will certainly be recommending you!! The lights really helped to transform the room and give a magical feel! They were absolutely stunning! We especially liked how they trailed down the wall at one end... WOW!